Customer experience (CX) as we know it is changing rapidly due to the combined use of technology that includes Big Data, Analytics, Natural Language Processing (NLP) and Artificial Intelligence (AI). Companies like Google, Amazon and Apple are not only investing in AI technology, they are developing AI to collect and analyze big data. In addition, NLP based speech engines use speech analysis for automated calls to customer service. When AI, big data and NLP are combined a tailor-made personalized customer experience is created. NLP is not only able to direct calls to the right department, the technology has become so advanced that it is now able to direct calls to a specific call center agent depending on a caller's tone and vocabulary. This transformation of customer experience allows businesses to drastically improve customer service. All leading tech companies are getting into the intelligent voice assistant space. Google's Home, Apple's Siri and Amazon's Alexa have become hugely successful and ever more popular. According to VoiceLabs, nearly 25 million voice devices will ship in 2017. Moreover, as hardware and software solutions mature, intelligent voice assistants get "smarter" and are now able to accurately understand information, do more and perform faster. All of this learning has resulted in a nearly 50% decrease in Google's voice recognition error rate in the past year. 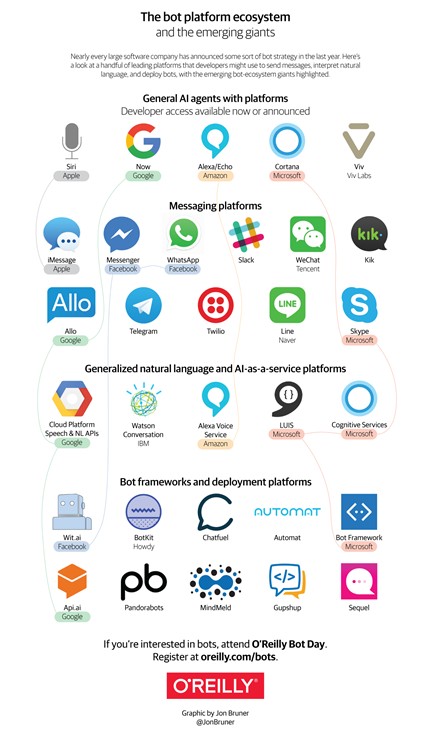 The combination of advancements in artificial intelligence, numerous messaging platforms and millions of people using them has resulted in the development of bots — more specifically, Chatbots. 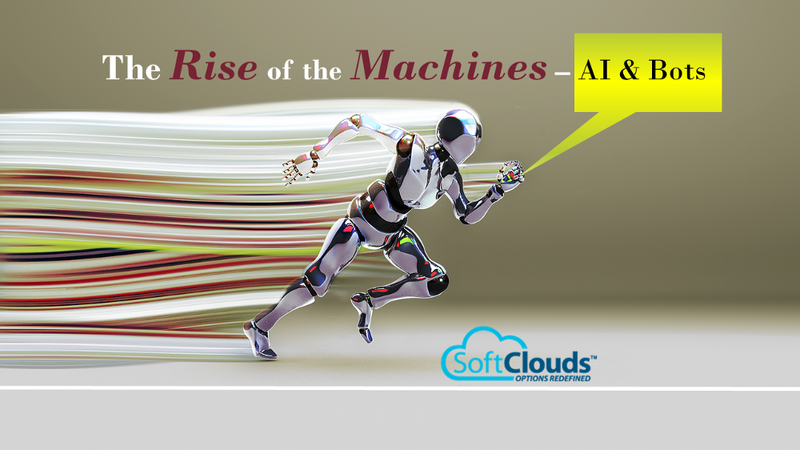 Bots are software applications that use Artificial Intelligence to perform simple and repetitive automated tasks. Chatbots communicate with humans through instant messaging (IM) apps (Facebook Messenger, Twitter, etc.) to provide conversational interaction by responding to queries, such as for customer service purposes. Chatbots, or chat robots, are slowly replacing humans in customer service and are revolutionizing the way customer service is provided. Compared to humans, Chatbots are less expensive and bring a more personalized customer experience that can handle tasks repetitively and do it around the clock without getting tired. Messaging Bots — Instant Messaging is a global communications phenomenon. Because of the popularity of IM, bots can be used as an adjunct communications platform. Conversational Interface — With advancements in NLP, in many instances, bots can mimic a conversation with a live operator. Through enhancements in AI and machine learning, 'talking' to a bot can be a similar experience to talking with a live person. Web View Bots — Building app like experiences on top of Web Pages. Canonical Interfaces — Because bots can 'learn' over time, the experience of interacting with a bot can be a streamlined and comprehensive experience. Group Messaging — Adding bots to groups or interacting with them in conversations can facilitate the conversation where the bot acts like a moderator. Human Supervision — Bots and AI can assist humans in different ways, especially traditional call center agents who are transitioning into chat bot supervisors. Bots can be used in virtually any industry; entertainment, news, games, finance, health and fitness, education, fashion and beauty, travel and leisure, supermarkets, restaurants, and shopping. Bots have changed the way business is done in various industries because bots can be programmed to handle frequent and repetitive questions, 24/7. They can provide help with customer service, concierge services, sales and collecting data. CRM Chatbots streamline the customer interaction process. They provide simple and up-to-date information and can give customers correct answers when provided with basic information. A concierge bot allows users to plan travel itineraries, book tickets, and store information for repeat travel plans. Sales Chatbots are used for cross selling, generating leads, and providing useful information to potential customers. Additionally, bots can collect and verify data, such as verifying a phone number, and do so quickly. Here are some good use cases where Chatbots are used today. Improve Customer Experience — Bank of America's Chatbot, Erica, helps customers make smarter financial decisions. The bot, available in the bank's mobile app, also allows users to chat with Erica by voice or text message, make payments, check balances, and even save money. Provide Concierge Service — Expensify's concierge bot can automate expense reports and travel arrangements. The bot can notify users if they're receiving the best travel deals, provide real-time pricing data on plane fares, cars, and hotels worldwide, and even trouble-shoot customer issues. Aid Sales — Shopify Messenger helps merchants instantly connect e-commerce stores to its customers. It allows consumers to browse retail catalogs, get product recommendations, pay for items, receive automatic order tracking and shipping updates and receive personal, detailed messages about orders — all through Facebook Messenger. Users also make customer service requests with 24/7 customer support. Banks, like Bank of America and Capital One, use Chatbots so clients can perform tasks like making payments, managing money, and asking questions regarding account balances, money management, payment history and recent transaction. Travel Chatbots are helpful in answering travel questions, providing tips and recommendations, and for booking flights. Companies like Amtrak, Copa America, Expedia and Kayak have Chatbots for customer service. Those who use the Whole Foods Market bot on Messenger can find store locations, search for recipes, discover recipes by using food emojis, and find store locations. Other food bots from restaurants like Taco Bell and Domino's Pizza allow users to order food and find nearby locations. Sephora's Chatbot on the messaging app, Kik, enables users to reserve a beauty makeover at Sephora stores. Other features include the ability to share makeup videos, tutorials and tips and recommend products for purchase online or in stores. Also on Kik, Victoria Secret's PINK Chatbot can provide suggestions for what bra to wear with an outfit and forward suggested bras to friends, and provide suggestions for teens looking for the perfect bra by inputting a few details of what they're looking for. One way for Chatbots to be successful in the service industry is to focus on a few key features that will be most helpful and useful for customers. The ability to nail branding strategy is also key. This means focusing on who will be using the bots and centering bot capabilities to those users. Having a specific channel for bots, be it Facebook Messenger, Kik, Slack, WhatsApp, or the like, knowing where the Chatbot will be embedded and most useful to customers will greatly determine its success. Finally, be creative and strategic when creating a Chatbot. This should be based on what the customer population, or target audience looks like. Therefore, knowing exactly who you will be providing service to and the kind of service the Chatbot will provide are of utmost importance. For example, if you're targeting the tech industry, you can showcase as AI/Chatbots. Bots will continue to have an impact on the service industry to improve customer satisfaction. Servion Global Solutions predicts AI will power 95% of all customer interactions by 2025. An increasing number of businesses will find new and innovative ways to implement service bots to meet the demands of consumers who prefer to interact with bots over humans and to delight their customers with an exception customer experience. As Artificial Intelligence grows in popularity, major tech companies will continue to develop bots to provide an exceptional customer service experience. However, like any technical innovation, consumers and industry will learn the technology's limitations. Since bots still can't handle everything a human can, a hybrid Chatbot/customer service model will emerge. This means combining the use of service bots and humans. Bots will handle simple requests and the bot will 'learn' its limitation to hand off more complicated tasks to humans. By combining AI and humans, customer satisfaction will increase and Chatbots will 'mature' by getting smarter. The result will be an evolving landscape where Chatbots gain intelligence and are constantly taking on new and more in-depth skills. Chatbots are just the beginning. Other technologies such as holograms and virtual and augmented reality will be used to enhance customer experience. Integrating bots in CRM will improve workflow by taking over tasks such as retrieving data, assisting in scheduling meetings, providing call suggestions, and setting important reminders. Bots will also be able to track customer data trends which will yield powerful analytics to the CRM back end. Someday in the future, bots may allow customers to use CRM as a primary engagement tool. Are you using Bots to enhance your customer's experience? Please feel free share use cases!! Do you have plans to implement Bots for a better Customer Experience? If so, why — if not — why Not?